Over the last 16 years, it has been my privilege to provide to the future bride among valued clients the gown she will wear on the most important day of her life. 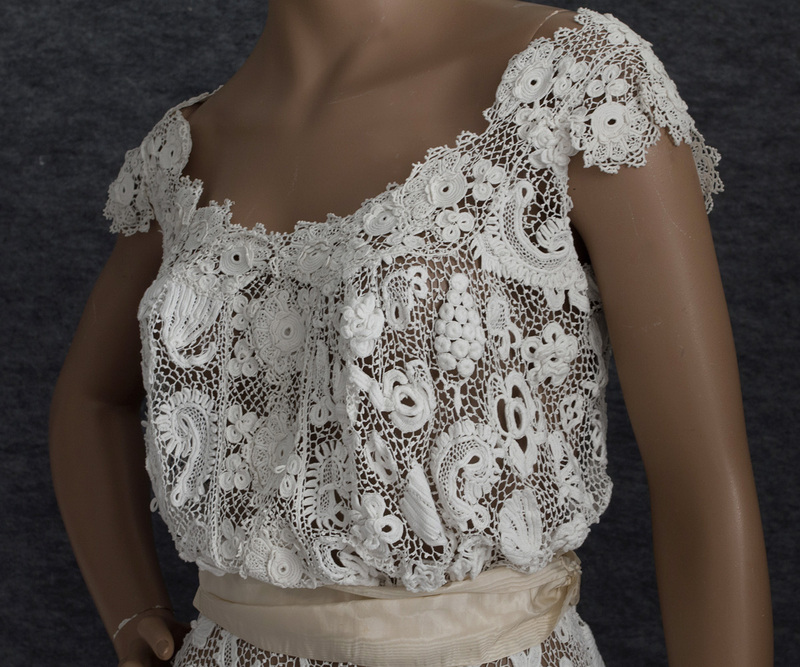 In this new section at Vintage Textile, you can share my pleasure in viewing a selection of these gowns as first presented on the site and then in all their glory at the wedding. 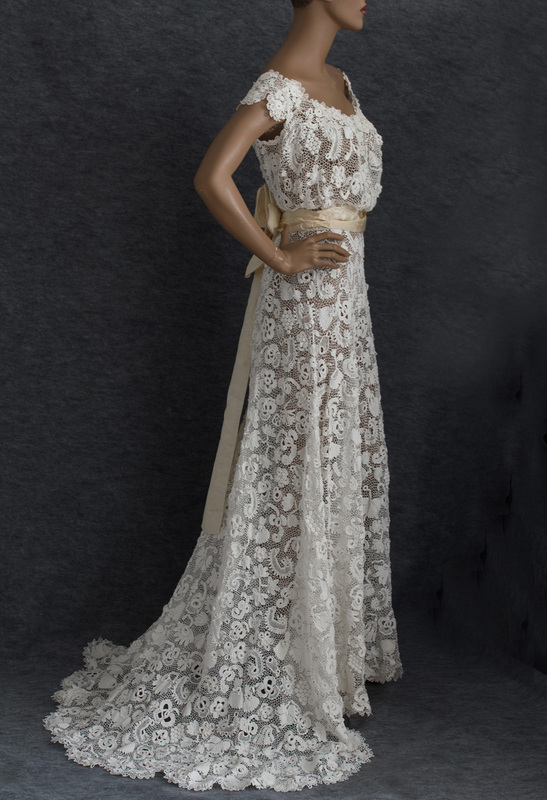 In a charming and stylish manner, the "vintage bride" combines the traditional with the modern. 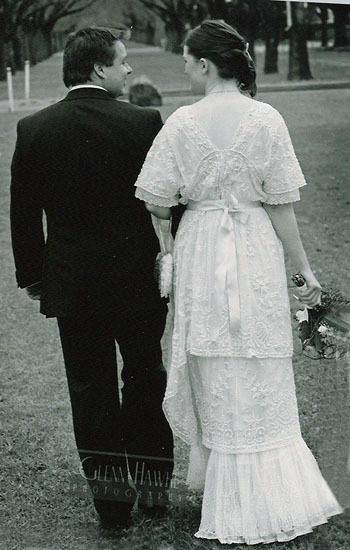 Like her grandmother, our bride yearns for the marriage of true minds, two souls joined in love for eternity. She is also quite modern. Her independent spirit expresses itself in the choice of a distinctive and gracious gown, the outward expression of inner joy and beauty on her wedding day. In our first dress, there inheres an uncommon beauty that is both historic and classic. 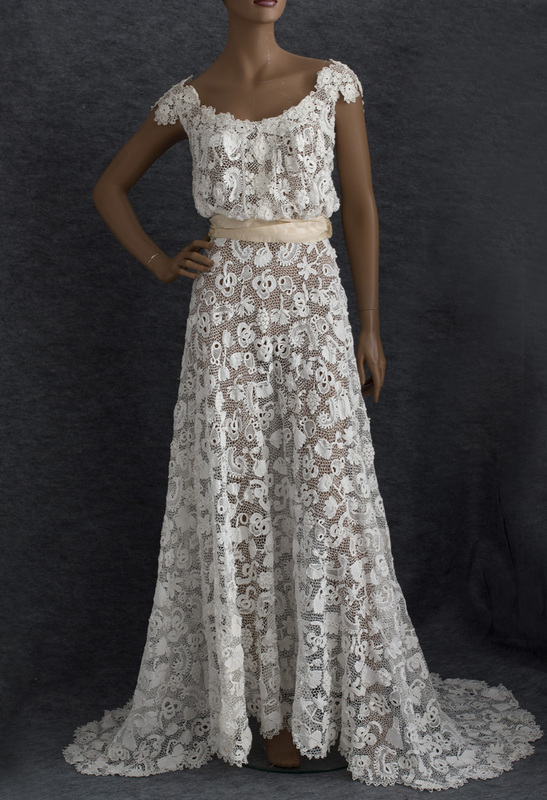 Custom designed from antique lace elements in the 1970s by the bridal department at Henri Bendel, the gown is both antique and 1970s vintage (modern and traditional). 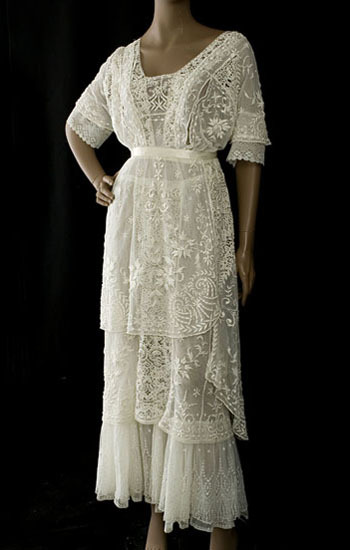 The dress is an harmonious symphony in lace, most of it handmade. 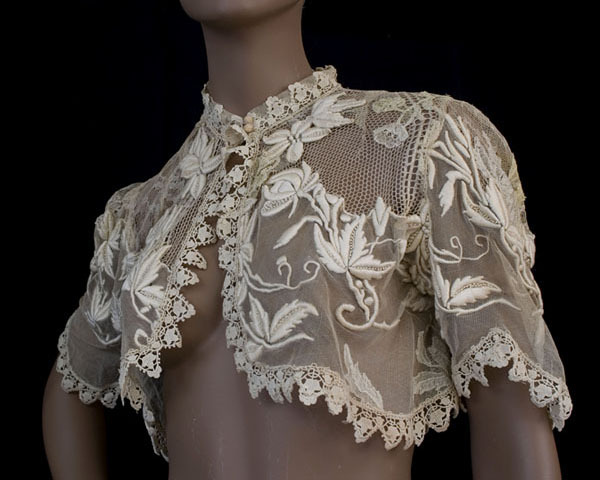 The period of the lace ranges from late Victorian to early 20th century. 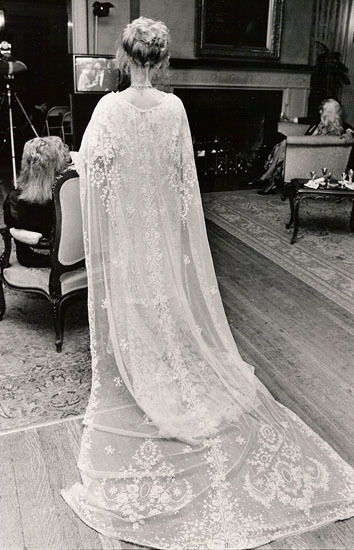 In the picture above, the bride prepares for the wedding ceremony. 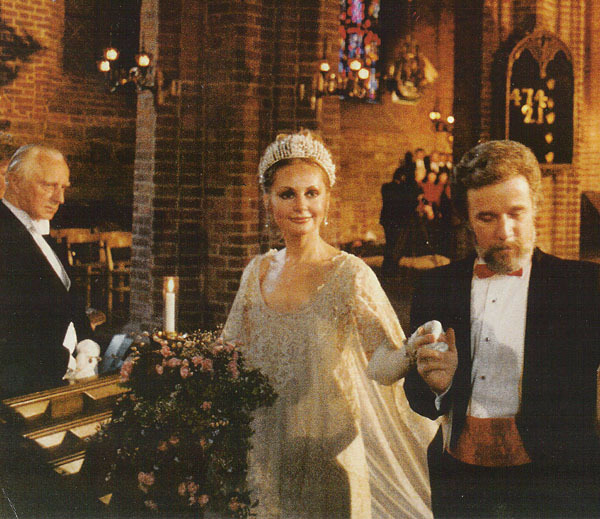 Below we see the bride and groom together in the historic church in Sweden where they took their vows. 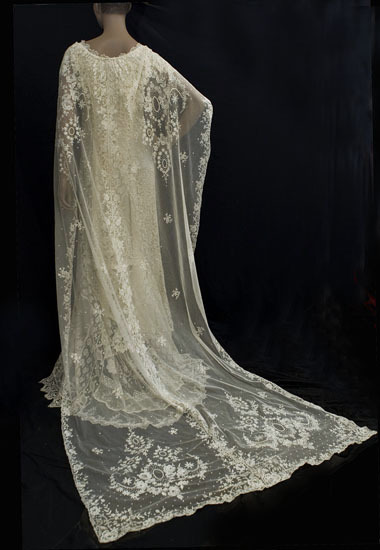 Our second bride chose a beaded tulle over dress, c.1910. Fashioned from white cotton tulle, the overdress is finely embellished with faux pearls, gold seed beads, and silver cut beads. 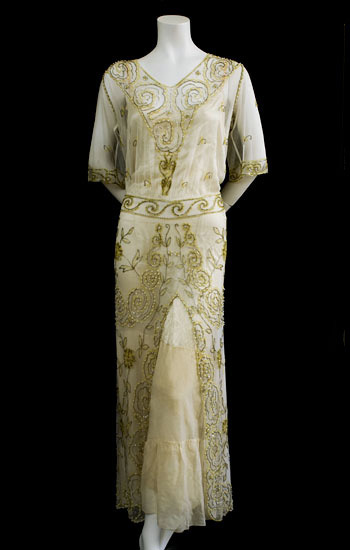 The designer used highly stylized, flowing, curvilinear forms in a memorable Art Nouveau design. The contrast between the quiet mystery of the sinuous, exotic motif and the bold brilliance of the materials is an aesthetic triumph. 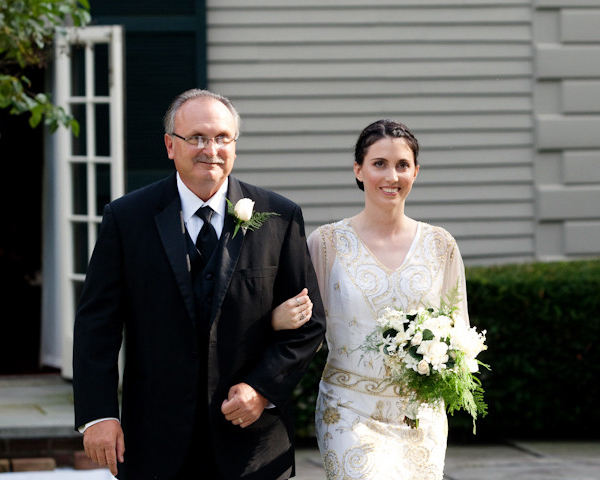 We see the lovely bride at a spring wedding in Rhode Island. The wedding pictures in the panels above and below are courtesy of Kevin Trimmer Photography. The panel above shows the bride preparing for the ceremony. 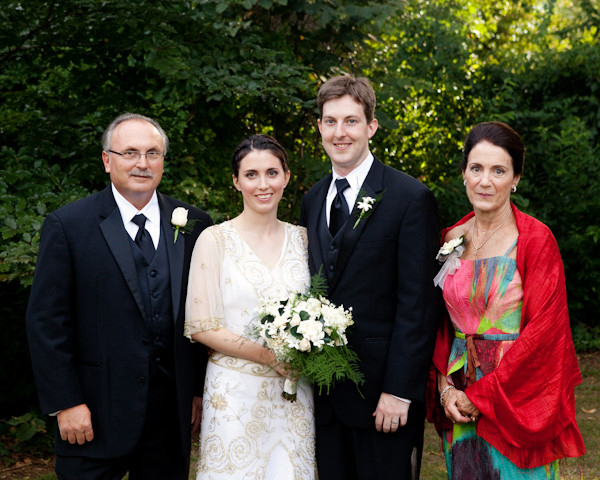 The panel below shows the happy couple at the wedding reception. (If necessary, click on the panel tabs to see additional pictures). 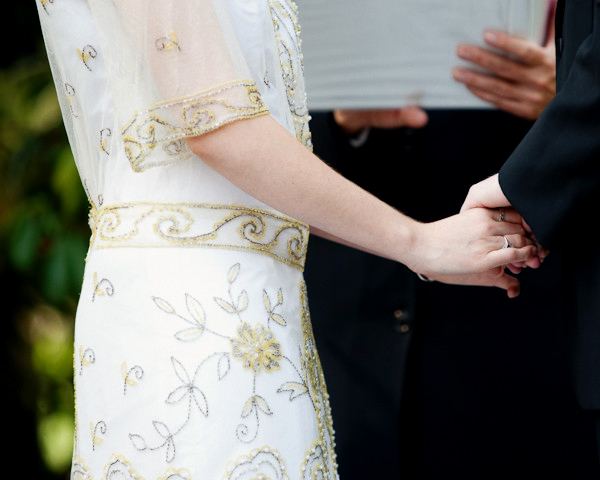 Marriage is a public ceremony, only the First Act in a lifelong Play, in which husband and wife share equal billing. 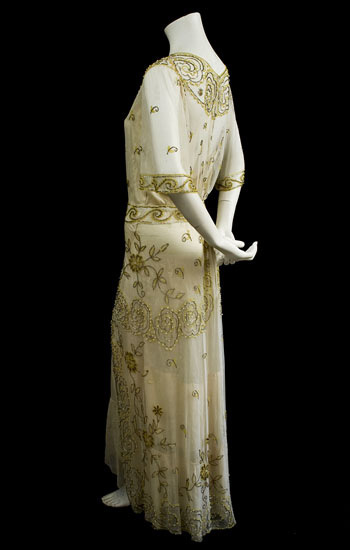 In Act I, however, the bride is the star, costumed in an elegant and graceful gown befitting the great occasion. 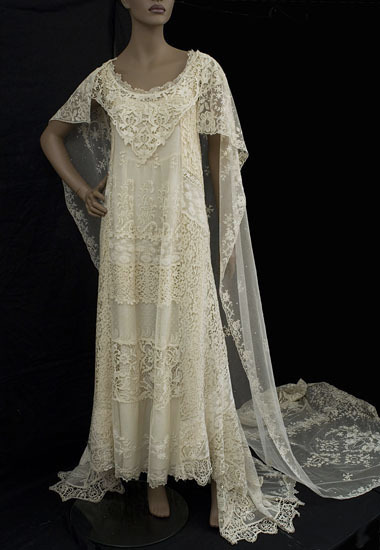 Our third vintage wedding gown is a hand-embroidered tulle tea dress, c.1912. The three skirt layers in the ingenious asymmetrical design lend a dignified charm to the happy bride. The two outer layers are hand embroidered with a floral pattern of raised padded satin stitch with eyelet accents. For a summer wedding, our gracious Australian bride "found my absolute dream dress, second love at first sight, my husband being first! When it arrived, I could not believe how stunning it was. It fit me absolutely perfectly. I cannot tell you how much I loved and still love this dress." Another Australian bride is shown in an embroidered mixed lace bolero, c.1905. As delicate as a cobweb, the bolero gently covers her shoulders. It features beguiling, hand-embroidered floral appliqués of padded satin stitch on a mixed lace/tulle ground. 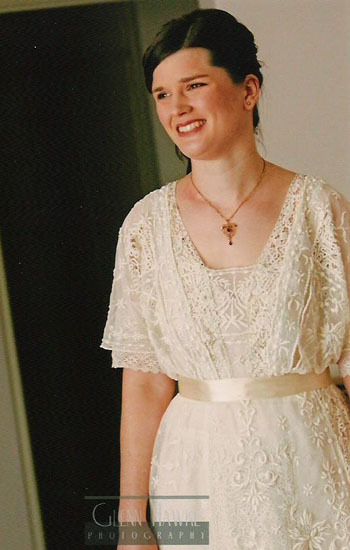 Our stylish Edwardian bolero gives just the right vintage touch to a traditional white wedding gown. The glowing bride is seen here at the December, 2009 wedding in Tasmania, Australia, where the sunny weather reflected the spirits of all the guests. 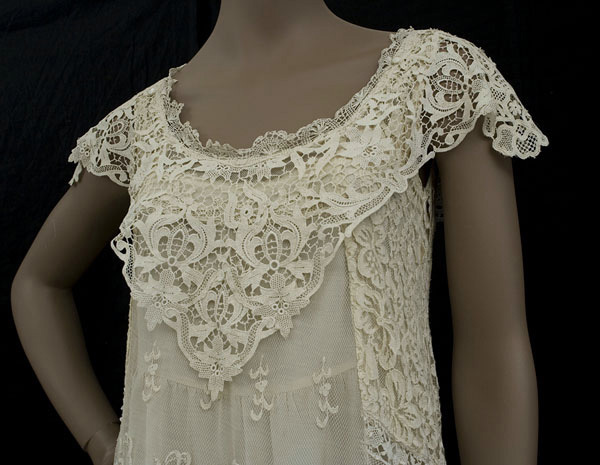 For an Irish crochet lace dress, the simple style creates the ideal canvas to display the fine lace. The skirt is longer and fuller in back. 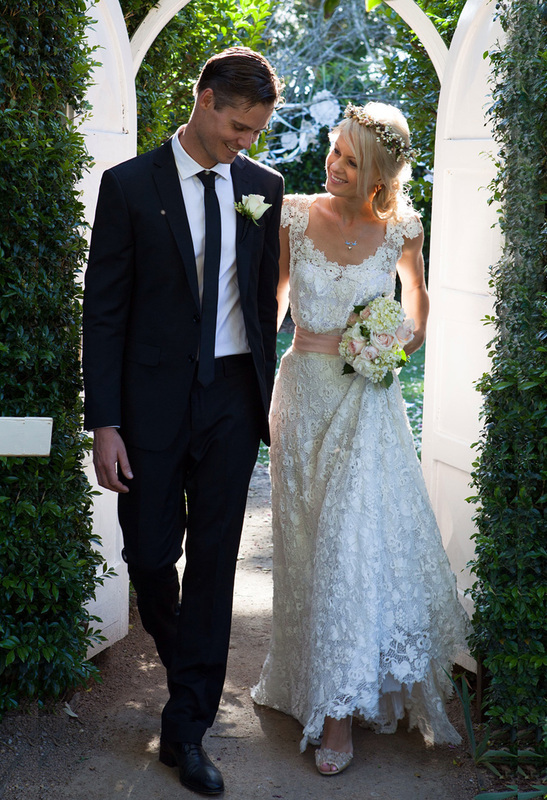 Our radiant Australian bride wore the magnificent dress at her October, 2013 wedding. 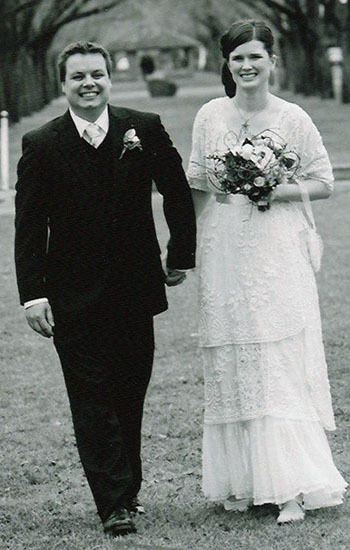 The bride wrote: "Here are photos from our wedding day. Everyone adored the dress. 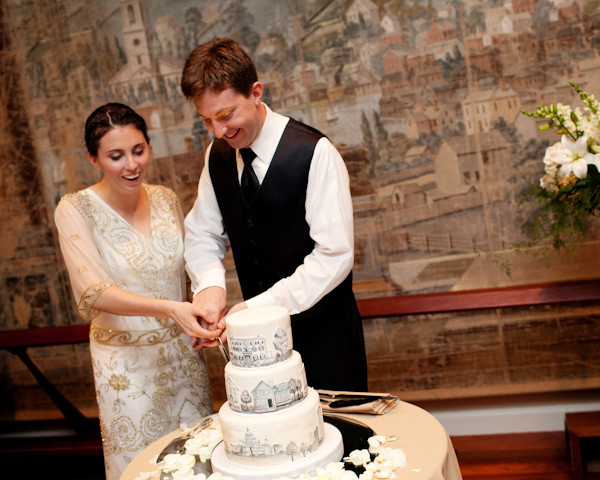 It fitted absolutely perfectly and was even more amazing than your pictures made it look!"